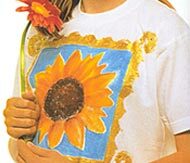 On the Sunny Sunflower T-shirt you can show off your artistic flair for color, shape and texture. In fact, your painting will be beautiful when framed in gold. So go ahead, wear your own creation. Insert a piece of card inside the body of the T-shirt. 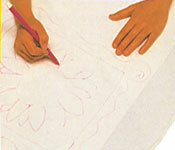 Use the fabric marker pen to draw the outline of the sunflower and the fancy picture frame. 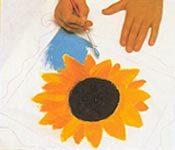 Paint the centre of the sunflower with black fabric paint. 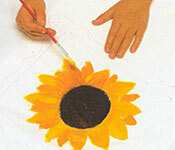 Use shades of yellow, red and orange to paint the petals. Allow the paint to dry. 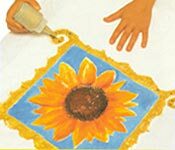 Use a sky blue fabric paint for the background of your sunflower painting taking care not to paint over the petals or into the frame. Again, allow the paint to dry. Using a clean brush, paint the picture frame with gold fabric paint. For the final artistic touch, decorate the gilt frame with swirls of gold glitter fabric paint. Usher in a bright day with this Sunny Sunflower T-shirt!